Just thinking outside the box a little here regarding the wing failure. Obviously it's designed (mountings-wise) to handle the forces put upon it when travelling in a forward direction. Could the spin have caused forces to be put on the mountings in a direction they hadn't expected and this caused them to weaken? I did a bit of research on front wing failures and the most recent I could find was Temo Glock, when he was testing for Virgin. The front wing fell off the car, after he had only completed 11 laps at Jerez, in February 2010. Or this one from 2013. You did a better job than I.
Romain Grosjean says Haas must solve the problems that are affecting its front wing after the Formula 1 team suffered its fourth failure of the season in Canada. I don't think any engineered front wing can withstand Grosjean's driving style. Maybe I am thinking way too simple here, but couldn't it just have been that the Pirelli tyres these days are so incredibly fragile that a few small flat spots can make the car vibrate like it's driving on cobbles? 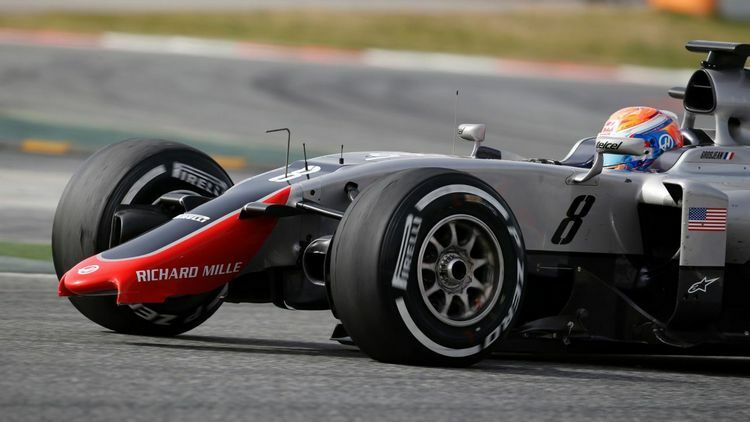 This wing should just about be ok for Grosjean? But that's a McLaren, surely....?